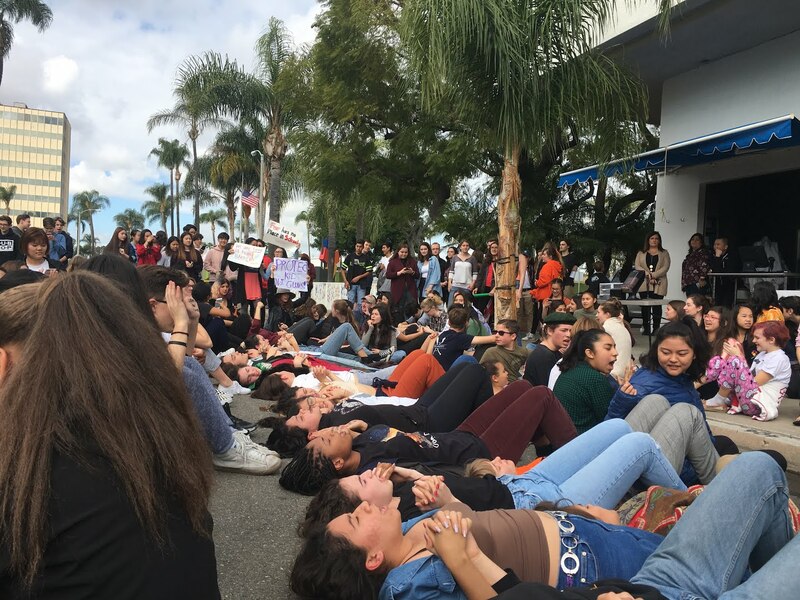 Students at the Orange County School of the Arts lay down, hands join, in protest on March 14, 2018. March 14 was a historic day across America and the world. Students in schools nationwide walked out of class and stood in solidarity with the victims and survivors of the Parkland shooting, protesting and calling for stricter gun regulation and legislation that could have the power to prevent mass shootings of this scale happening again. However as with any powerful movement, resistance has been met, with some schools even threatening seniors with their Prom or the right to walk at graduation if they participated in the walkout. The primary question posed by parents, students and school officials is: does protesting have a place in a school environment? The issue taken by many of those opposed to the protests is the disruption of classroom learning time. In the time of year when many high schoolers are cramming for SAT , ACT and AP tests, every minute of instruction can be vital to teachers, though it can be different depending on the subject of the class. Despite these valid concerns, schools cannot restrict the right that students have to peacefully protest or exercise their freedom of speech. It’s a delicate issue. At many schools, students in charge of organizing walkouts have notified the administrative staff ahead of time, coordinating and checking thoroughly to make sure that the kids that want to protest and express their ideas, can. At the Orange County School of the Arts in Santa Ana, the walkout was immediately preceded by an active shooter drill for the entire school, and the protest itself was almost treated as a school-sanctioned activity. In fact, many OCSA students felt that having staff approval made the protest miss the point. They felt frustrated at the messy nature of the protest and at a few teachers and staff who expected the walkout to be over rapidly. In situations of compromise, it’s easy for both sides to walk away dissatisfied. Know your school’s policies. If you go to a private school, the administration may have their own demonstration and speech code, separate from your own local government, seeing as it’s private property. Remember behavior can be punished, but ideas can’t. Schools can easily give you detention for putting vulgar words or terms on your signs or shirts. Opt for information and clear statements of your ideas. Take advantage of non-class time, like lunch, and before or after school time, to be minimally disruptive and most effective. Avoid violence. Violence discredits any group or protest, not to mention it’s easy and fast grounds for your school to suspend or even expel you. For more information like this and a complete, detailed guide to your rights to protest at school, go to cbldf.org/beheard. Spread information and awareness to keep yourself and your peers safe while getting your message across. At the end of the day, the protest on March 14 was not a protest against schools, or even anything the schools could control. It was about the NRA, the American government, and lending support and solidarity to the students in Parkland. In the wake of this, some students are left wondering if the protests at their schools, all across the nation, were actually impactful or effective. Though I can’t speak for all schools, or even for all my classmates, but I can speak for myself. At the March 14 protest, students at my school chanted “This is what democracy looks like!” and “We demand change!” until out throats went raw. People brought signs and held up peace signs and hands with messages on them. I laid down and held hands with complete strangers, yelled in unison with people I will never again talk to. And when our school-approved protest time was up, we refused to end. Hundreds of students sat down in the middle of our campus. I felt the force of how much everyone cared. It didn’t matter whether or not our teachers were going to let us when we all put our foot down. We are unstoppable.